The Milsteins have been loyal supporters of Jewish communal organizations that have helped generations of Jews to find their way in America, while preserving their unique heritage: American Jewish Committee, Jewish Agency for Services for the Aged (JASA), the Jewish Museum, Jewish Theological Seminary, UJA-Federation of New York, on whose Boards Milstein family members have served. In order to mentor and motivate the next generation of Jewish leaders, Howard Milstein assumed the Chair of the UJA’s Jewish Leadership Forum New York Metro chapter from 1998 to 2007. The group received private briefings from Jewish lay leaders and political figures: U.S. Senators Chuck Schumer and Joseph Lieberman; business leaders Maurice Greenberg and Morris Offit; New York City Schools Chancellor Joel Klein, among others. Howard Milstein also hosted one-on-one lunches with prospective young leaders of special promise. In 2007–2009, Howard Milstein was appointed as Co-Chair of UJA’s Annual Campaign. 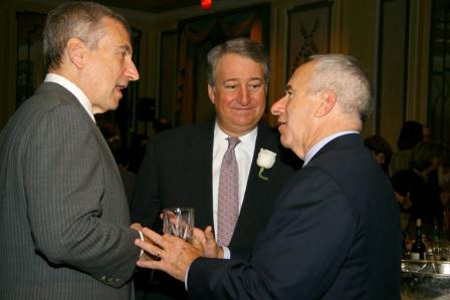 Howard Milstein with Jerry Levin, President and John Ruskay, Executive Vice President of UJA at the 2008 UJA Banking & Finance Dinner.